Only you and your family can define what balance looks like to you. 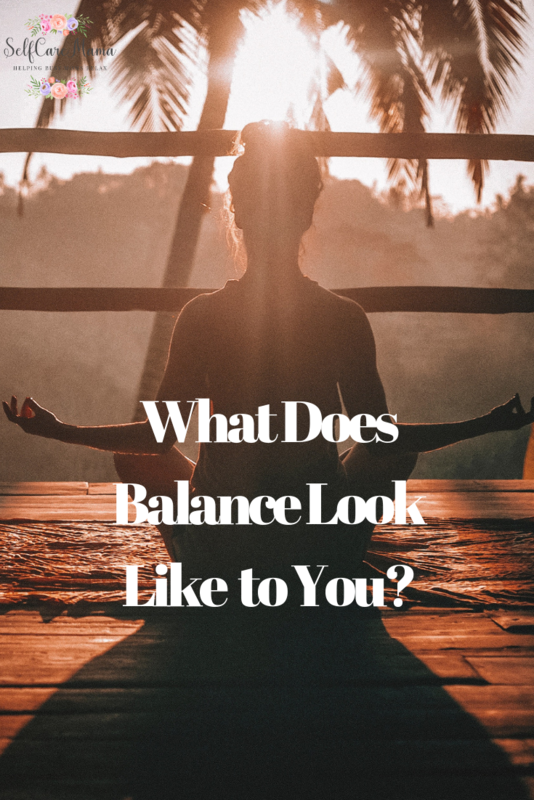 What does balance look like to you? Does balance look like you staying at home with your kids full-time? Or is it you working part-time? Maybe it’s working from home part of the time and at the office part of the time. Maybe it’s having a side hustle. Or maybe it’s something all together different. Only you and your family can define what balance looks like to you. And it’s going to look different in each season of life. My life has looked very different over the years of being a mother. I was fortunate enough to stay at home with my daughter for the first two and a half years. I wouldn’t change that for the world! At the same time, I don’t believe I was living a balanced life. I was not being intentional with my life and had no concept about self-care. My entire world revolved around my daughter. After my divorce and up until now (5 years later), I have tried to balance working full-time and raising my daughter. I’m still not living a balanced life. I let my life completely overwhelm me and dealt with depression for quite a long time. I never want to be in that place again. It’s not just because I was a working mom, or a single mom, or depressed. It was a combination of everything going on in my life. I got time to myself. My daughter went to her dads every other weekend so it was it was built in time for myself. But again I wasn’t intentional about it. My suggestion is to make a list of those things that make you feel relaxed after doing them. Then write down how long it takes to do them (or how long you need to do it to feel refreshed). If you’re like me, you will probably sort it by time. I love sorting on an Excel spreadsheet. It’s the math whiz in me! Now you have a ready-made list to help you relax and take care of yourself. I would challenge you to pick something from this list every day. This is how you will reach an ideal level of taking care of yourself. If you can’t commit to everyday, maybe set a goal to pick an item once a week or when you are feeling overwhelmed. Also, please remember that this list will look different during each season of your life. You won’t be able to go away on a spa weekend if you are nursing a baby and splashing in the puddles with your kids may not be as appealing when they are teenagers. Let me know how you are balancing your responsibilites and taking care of yourself? Ready to make a change in your life? Join my 5 Day Mama Me Time Challenge and learn how to find time to carve out for yourself and get off the struggle bus! Starts Monday, May 6th! Hi! I’m Jessica McCarty and I created Self Care Mama Coaching to help busy moms find balance and fit self care into the pockets of their lives. I work with you where you are at currently and help you find ways to do the things that you already enjoy to help you take care of yourself.